The weather is getting warmer and light spring jackets are one of the must-have wardrobe items for this season. Here are some quick tips on how to nail your season's look with the best men's spring jackets 2018. Freezing in a shirt and sweating out in a winter coat? It's time for some light spring jackets to be introduced into your life. Whether you like to dress simple and casual, or you have a trendy and sharp style, men's spring jackets are key pieces in every mans wardrobe. Unpredictable weather doesn't have to become the enemy of your comfort or look, you just need to be prepared for all eventualities. If you're trying to upgrade your style, check out this guide and discover the best light jackets for the season. We'll never get tired of good old denim. Simple, unpretentious and cool, denim jackets for men will always give your look a fresh and easy-going touch. 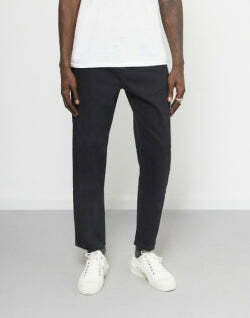 A staple item that every man should own, they’re ideal for mild weather and almost any casual setting. If you're trying to achieve a spontaneous, effortless-appearing style, denim jackets might be the best way to succeed. The history of men's denim jacket begins in 1878, when Levi Strauss created the Triple Pleat Blouse. In the first years of the 20th Century, cowboys, miners and railroad engineers adopted the jean jacket because of its resistant and adaptable cotton textile. So how should you wear denim jackets? The best denim jackets for men are extremely versatile. Match yours with a T-shirt and trainers for an informal appearance, or dress it up with a patterned shirt and loafers if you want an urban and sophisticated outfit. You can even pull off double denim, but you need to make sure that the colours and shades of the denim jacket and the jeans are different. Colour tip: light blue is the standard jean jacket's colour, yet black is the perfect choice for those who want to get a smarter look. When putting together an outfit with a denim jacket, remember that it's all about layering. Layers are not only functional and practical for unstable weather, but they also add visual interest and texture to your overall look. Play with colours but don’t overdo it, and try to wear thin layers to avoid getting bulky and messy. You may not think leather jackets are a good summer item, but you'd be surprised. The best leather jackets are so easy to wear that every man can pull one off. They're perfect for transitional seasons and they can take you from day to night with great ease, as their versatility allows you to use them in a casual outfit or to smarten up your style with a simple twist. Leather jackets go back to the first decades of the 20th century. In World War One, they were worn by German fighter pilots and Russian Bolsheviks as their fabric protected them from the extreme climate conditions. A few years later in the U.S., Irving Schott designed the first leather motorcycle jacket. This simple garment can turn your outfit around and give you serious street style merit. There's a wide range of models available, so you'll be able to find one that fits your budget. Channel your inner rocker and grab yourself one - not that you need any more convincing. When buying a biker jacket, make sure it fits you well - leather is a difficult fabric to tailor. The perfect biker jacket must sit close to the body but always leave some room for a jumper or a T-shirt underneath. 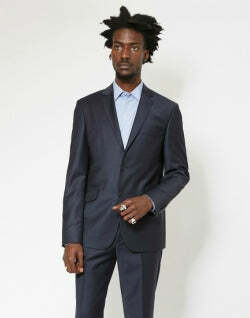 The jacket should sit at waist height and the sleeves shouldn't come down longer than the wrists. How can you style your biker jacket? Go for a sophisticated look and mix it with a white button down shirt, a pair of black trousers and black brogues, or match it with a T-shirt or a jumper in a neutral tone, a pair of black skinny jeans and Converse for a full rock and roll look. 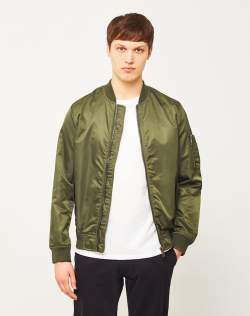 A bomber jacket is the perfect men's spring jacket as it works just as well for both day and night. Just like many other men's wardrobe staples, the origins of this garment can be found in the 20th Century’s military wear. 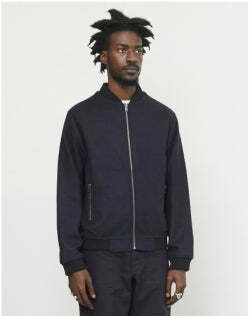 The MA-1 flight jacket was designed for the US Air Force in the 50s and was worn by US pilots up until the Golf war. Today, bomber jackets come in different fabrics. The most common ones are nylon, suede and leather. The best thing about nylon, besides being extremely lightweight, is that you can choose between a wide variety of colours. If you already own a black bomber jacket, it may be time to pick a bolder tone. And if you're after a dressed up look, leather is probably the way to go. 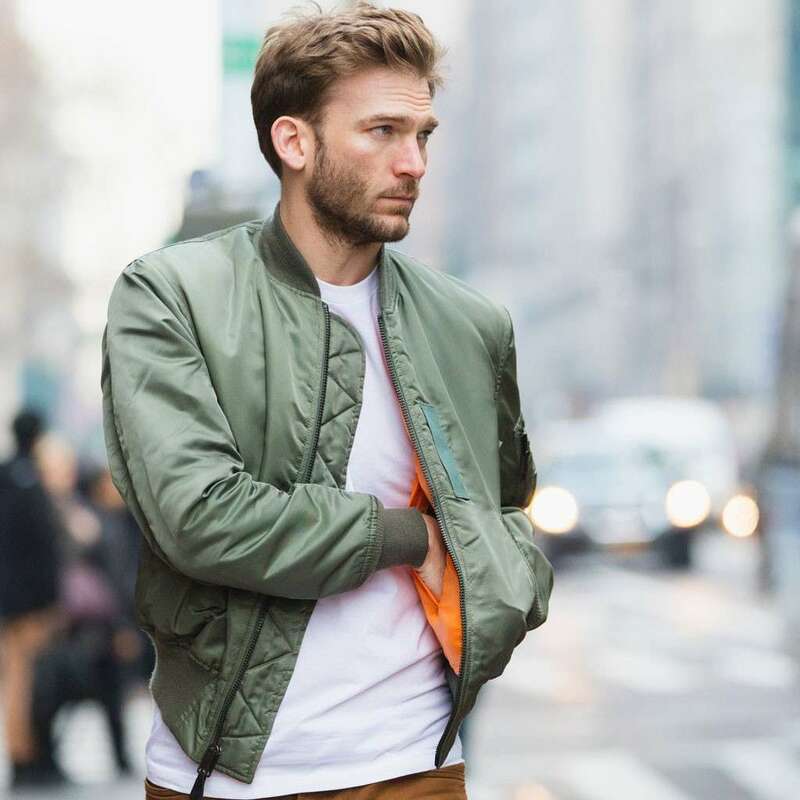 With bomber jackets, you can keep it casual or dress it up. Match your jacket with blue jeans, a crisp pair of white trainers and a white T-shirt to get a trendy and sharp look. Or, if you feel like making a statement, choose a printed bomber jacket and pair it with a grey jumper and a basic pair of black trousers. The Harrington jacket is more than just a weapon against unpredictable weather - it's a timeless and classic item that every man should wear. It doesn't matter how old you are or what is your body type, a Harrington jacket is spot on - wether you're 20 or 60, short or tall, skinny or curvy - and are easily one of the best choices for a masculine, functional yet comfortable outfit. The Baracuta G9 Harrington jacket, better known as the best Harrington jacket ever made, created in 1937, can be easily recognised by its checked tartan cotton lining. Harrington jackets got their current name in the 1960's, after the character Rodney Harrington, played by the actor Ryan O’Neal in the prime time soap opera Peyton Place. A Harrington jacket's fit ought to be a little roomy. Their sleeves should cover your wrists and you should be able to move your arms freely. As for the length, the elastic hem should cover your underwear waistband. Regarding colour, get yourself a navy or khaki Harrington jacket if you want to play it safe, or go for dark green if you're just not that traditional. The truth is, Harrington jackets have officially made a comeback and there are tonnes of ways you can match them and find a look that suits you. Don't go for a cheap Harrington jacket - always take the time to invest. Mix it with a T-shirt, jeans and boots if you want to keep it simple, or raise the stakes and choose a button down shirt for a preppy look. If you wanna get a smart and casual look, sports jackets might be the right choice for you. Their length and cut is similar to that of suit jackets, yet sports coats are less formal and don't come with matching trousers. They were originally designed for watching outdoor sports. Over the years, sports jackets were increasingly worn on more formal occasions. So what goes best with the sports jacket? 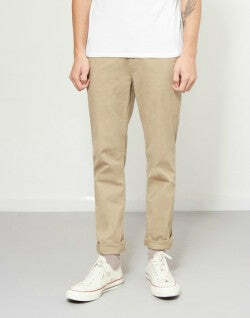 They look great with a shirt, wool pants or chinos, but also match perfectly with a T-shirt and jeans. Go for a neutral colour like grey or navy, and the sky is the limit. A navy sports coat with a plain white shirt, coloured chinos, brown leather belt, brogues or desert boots and a scarf on chillier days is a perfectly smart way to execute a savvy sports jacket look. Looking for a durable, versatile and classic jacket? A waxed cotton jacket would probably be your best choice. 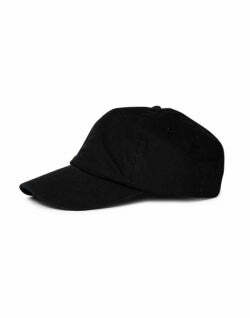 Casual and ideal for wet, but not freezing, weather, they come in different styles and cuts. Have a look for one that fits you just perfect - they're long-lasting pieces that you won't regret buying. It was 1894 when John Barbour founded J. Barbour and Sons Ltd in the Market Place in South Shields. 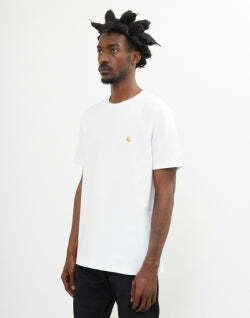 He wanted to produce weatherproof clothing for fisherman and sailors. They later proved to be incredibly solid, durable pieces and were worn by British soldiers during the World Wars. Today, Barbour jackets and waxed cotton jackets are almost synonyms. Waxed cotton jackets come in different shapes - essentially, in three different types of fit. The relaxed fit is roomy and allows layering underneath, still preserving a classic style and is perfect for those who put comfort first. The regular fit is a little bit less spacious, but it still leaves plenty of room for ease of movement. 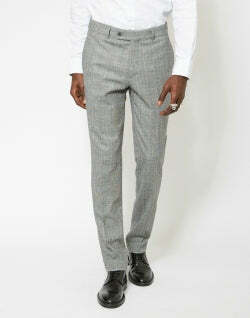 Last, but not least, the slim fit is designed to give a modern and sleek silhouette. There are several styles of waxed cotton jackets for you to choose from. We suggest you channel Daniel Craig's James Bond look with the Barbour Beacon Sports Jacket or Barbour Commander Jacket which were inspired by the jacket the actor wore in the movie Skyfall. Beware of the fitting - they're quite slim, so you may need to go up one size. Trench coats offer two important advantages; they provide more coverage than other jackets and their adjustable belt helps in cutting a more flattering figure. The ideal item for a smart and stylish look, they are perfect pieces for transitional seasons and a great garment to upgrade your outfit. The trench coat was created on the last decades of the 19th century with both Burberry and Aquascutum claiming to be the original inventors. It was worn by British and French soldiers on the trenches of World War One - hence the name. Trench coats are one of the most classic men's clothing items. If you decide to invest in one, you'll be able to wear it for decades with a little love and care. When getting yourself a trench coat, you should pay attention to the length - the most flattering fit for a trench coat would hit just a few inches above the knee. 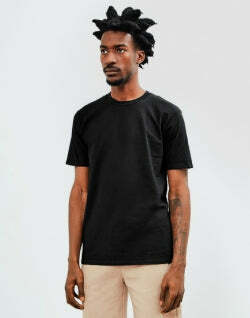 As for the colour, you'll never go wrong with khaki, black or beige. Trench coats are incredibly versatile, making them perfect for a classy office and easily translatable into a stellar evening or casual outfit. Match your trench with a suit and tie for a more formal setting, or pair it with some simple trousers and a T-shirt to look effortlessly elegant. Shearling coats are a classic winter item, yet they'll be your best ally on those cold and windy spring days. The shearling jacket has been adopted by several brands this last year so you'll be able to choose between different models, styles and fabric combinations. Shearling comes from recently sheared sheep or lamb, the skin that's been removed is tanned and dressed with the wool left on it. Shearling can also be made from synthetic fibres, however, it's not as breathable and flexible as real sheepskin - but it's definitely more affordable. A winter look cannot go wrong with a shearling coat, and there’s nothing softer and cosier than wool in the colder months. Besides its comfortable fit, the most interesting aspect of the shearling coat is the way it allows you to mix tradition with making a statement. It won't be the cheapest jacket you'll get, but it'll be worth the investment. Men's shearling aviator jackets were used by the first air pilots as the warm fabric protected them from the cold air at extreme heights. Over the decades, they became a classic garment that'll never go out of style. 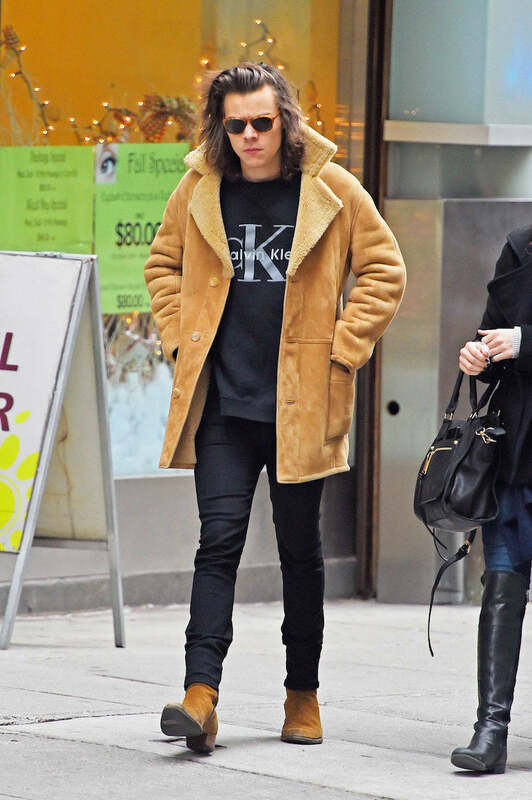 If you decide to get yourself a shearling aviator jacket, you can match it with a dark pair of jeans, boots and a shirt to go for a 70s look. 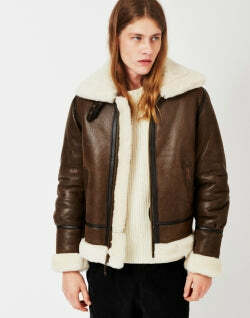 Shearling aviator jackets for men are masculine and strong items that'll definitely upgrade your outfit. Yet, if you think full shearling is not for you, or if you don't want to spend that much money, you'll find leather, denim and bomber jackets with shearling collars and details that'll be ideal for chilly spring days. Denim jackets are the perfect transitional piece, and are great for achieving that effortless style. Leather jackets are ideal for taking you from a casual day to night outfit, and aren’t as difficult to pull off as you might think. Bomber jackets have stood the test of time, and while black is a safe bet, go for a brighter colour for a nice spring time look. Harrington jackets are a firm favourite with Hollywood stars, and their lightweight style means they’re ideal for spring time sunnier spells. Men's spring jackets are functional and adaptable wardrobe items that can be matched with different garments for nailing a wide variety of looks. There are great jackets out there waiting for every man, regardless of age, style and body shape. From denim and leather jackets to shearling and trench coats, all types of jackets have their advantages and strong points so you shouldn't say no to any of them before trying - you might just easily get it right.